LEXINGTON, Ky. (Nov. 13, 2015) — The 11th Annual Girls in Engineering, Math and Science (GEMS) event will take place 10 a.m-4 p.m. tomorrow, Saturday, Nov. 14, on the University of Kentucky campus. It is the largest Girl Scout Council event of the year that is hosted by the UK College of Engineering, with more than 300 girls attending. 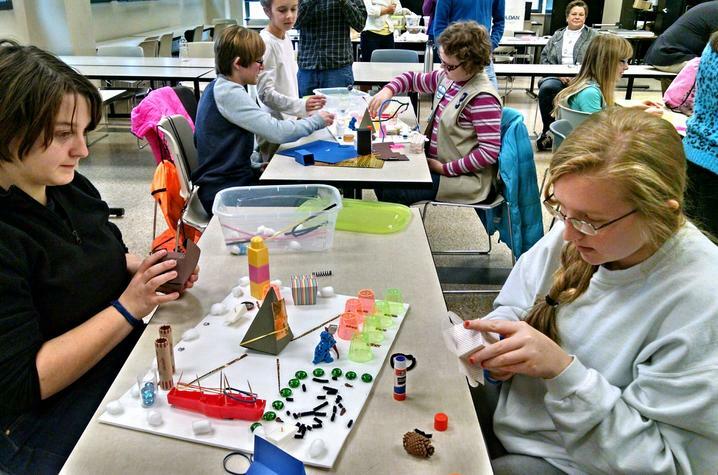 GEMS is a collaboration between the Girls Scouts and the University of Kentucky. Learn to extract plant DNA and the types of analyses that can be done with these. Learn about plant diseases and their causative agents. Observe diseased samples and the infecting microbes. Using the Landfill Enviroscape for a hands-on experience, girls learn where our garbage goes and about the very costly and sophisticated methods now used in disposing of our waste. Developing this concept leads to a discussion of why, how and what we recycle in Kentucky, and how our mindset can change so that we respect our environment and create less waste by designing new products that will never enter the landfill-bound waste stream. Ideas for Recycled Art Projects will be provided. Learn about how hobbies and interests can be related to engineering. Using the Monarch butterfly, girls will learn about many aspects of engineering – mechanical, chemical, aeronautical and biosystems. Girl will learn how butterfly wings are shaped and angled to create lift so they can fly long distances. Girls will learn about the butterfly lifecycle and create colorful paper butterflies to take home. Girls will enjoy hands-on activities that will teach them about different electrical devices. Girls will measure the electrical current and power when the device is connected to a light bulb, two light bulbs in a series, LED, a motor, an electromagnet and a buzzer, and compare the electrical power used by household devices. Girls will work in teams to design and build a scale model of a future city located somewhere on Earth or outer space. Girls work with Dr. Walcott to a build a tabletop city model with recycled materials and present their ideas at the end of the workshop. Girls will primarily be following the official Future City Rules posted here http://futurecity.org/. A stream table is like a sand box with water that geologists use to model how rivers change though time. Plan your riverside community, then watch it wash away if you didn’t plan wisely! The workshop will introduce girls to computer programming using the ALICE programming language. Alice is a language developed at Carnegie-Mellon under an NSF grant to encourage programming in middle/high schools, especially with girls. This is a very visual language. Girls will work in pairs on the computers. This workshop will be a quick overview of the proper nutrition needed to encourage elevated brain functioning and physical development. Girls will have fun with physical activity and exercise routines and will do hands on activities to learn to measure body composition and other clinical assessment techniques. Did you know that cosmetics companies employ teams of specialized chemists to develop and test each new line of makeup, perfume, lotion, or soap? This workshop lets you be the cosmetics chemist. You will learn which liquids to use in a solution to make your own lip gloss to take home. We all need food to grow and thrive, but how does this food become our fuel? Enzymes perform a chemical reaction acting like scissors to break down food into sugar. Our bodies produce a unique set of enzymes to perform this digestive task. Girls will learn about how enzymes such as amylase and lactase help us digest food. We will do experiments to understand how amylase breaks down starch in bread, how enzymes can help people who are lactose intolerant digest milk, and how the structure of proteins makes this all possible! A chemist's job is to cause chemical bonds to break and others to form, so that new molecules to form. When a carboxylic acid reacts with an alcohol, the products are an ester and water. Organic esters are responsible for the pleasant aroma of many fruits and perfumes. Girls will generate esters from different combinations of alcohols and acids. Girls will then activate olfactory receptors (their noses!) to detect the different fragrances that they will be creating. 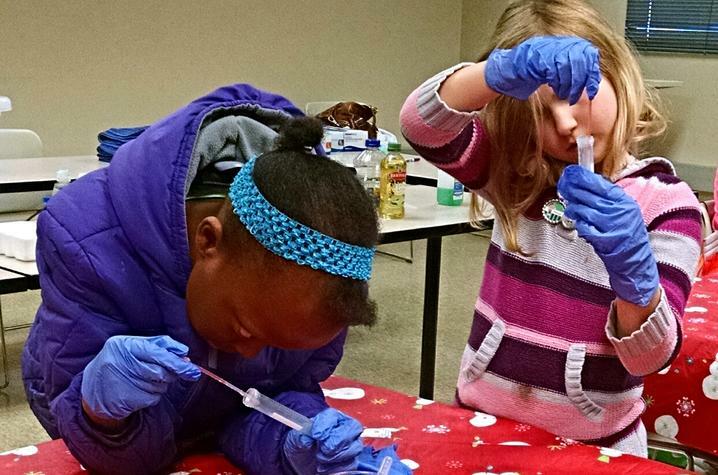 This workshop gives girls the chance to explore biotechnology with yeast and fermentation. Girls will have the chance to develop their own experiments and analyze their results. We will be learning about one of the oldest biotechnological processes known to man and get a chance to view live yeast cells under the microscope. Food Engineers use science and engineering principles to develop the best methods to create and process food. Not only do food engineers help make our food safe, they also work to make it taste great! Girls will learn about the chemical and physical properties involved in making the best "frozen" treat of all - Ice Cream! Join the PBS series "SciGirls" and the Kentucky Science Center for a hands-on, minds-on introduction to the engineering process. We will be highlighting Citizen Science project, Frog Watch. Participants will learn about the impact of environmental science research of frogs and toads calling as they create a Wetland band. This sessions is designed to present community based strategies for engaging girls in STEM. Do you want to know what’s inside a computer, how it is assembled and how it all works together? Girls will learn what factors make some computers/portable mobile devices better than others through a series of practical tasks girls perform on a mobile device. Girls will make a necklace to take home out of solar beads. Girls learn about the ultraviolet light spectrum and how it is used in engineering applications. In this workshop girls will learn how civil engineers design skyscrapers to withstand different loadings (e.g. static, wind, snow, earthquake, etc.). Then they will work in teams to design, build and test their own tall structures. In this workshop, teams of girls will make a loud speaker from household items including paper plates, thin wire, and a magnet. In just 30 minutes, girls will learn the fundamentals of how speakers work and build a speaker that they can plug directly into their cell phone to play their favorite music. Girls enjoy working with an electrical activity to turn on lights, sounds and flying saucers. Snap Circuits make it all possible. How do workers transport munitions through the destruction process at the Blue Grass Chemical Agent-Destruction Pilot Plant when the machines are located inside sealed buildings? With robots, of course! Inside the Munitions Demilitarization Building, a series of automated equipment and robots will process the M55 rockets. Engineers and scientists work together to ensure all workers and the community stay safe. This presentation demonstrates the use of robots in the chemical weapons demilitarization process. Participants will work as a team to operate robots in a munition processing simulation. For more information, visit www.engr.uky.edu/gems.